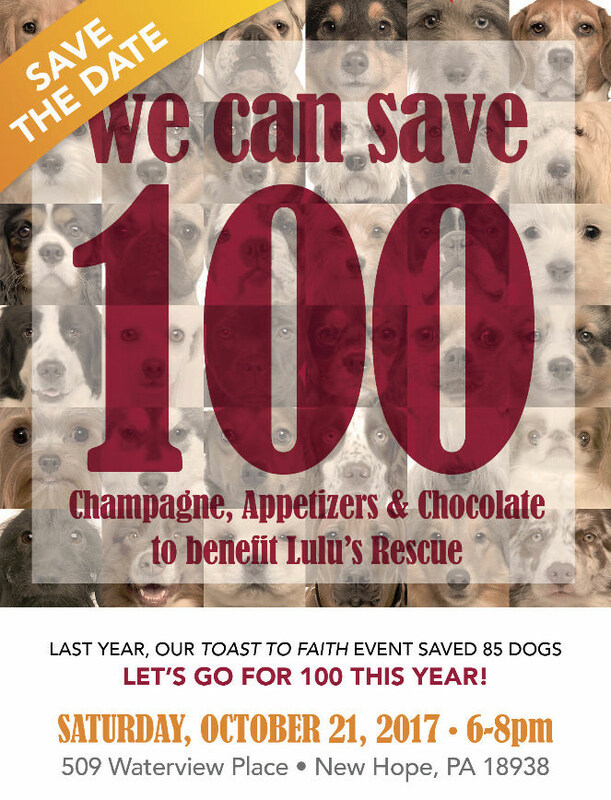 Donald and Douglas Pearson of Kurfiss Sotheby’s International Realty Will Host a Cocktail Party Fundraiser for LuLu’s Rescue on October 21, 2017 from 6:00 – 8:00 pm. Chive Catering will provide hot and cold hors d’oeuvres and Pierre’s Chocolates has signed on to provide a delectable display of candy. Enjoy Sotheby’s Grand Cru Champagne, meet dogs rescued by Lulu’s, and browse select items offered through the event’s silent auction. For more information or to RSVP, contact Lisa Vargo: 215.383.2379. Lulu’s Rescue is a companion animal rescue group comprised of dedicated members with over 30 collective years in rescue, foster, and adoption placement. We are an all-breed inclusive rescue advocating on behalf of all dogs and are officially a public charity having obtained our 501(c)3 non-profit status. We are committed to finding the best homes, for these amazing creatures, ones in which they can flourish and live out their natural lives surrounded by loving care and kindness. Our policy is not first come first served but rather which family would be the best possible match for our furry friends in need.